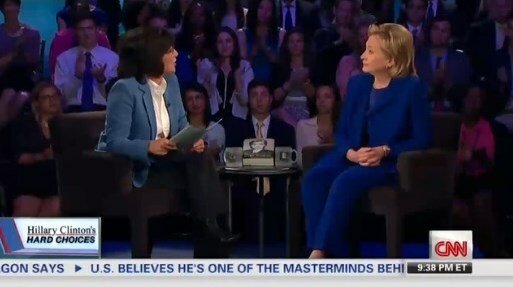 CNN deployed an enthusiastic stage director who coached the audience to applaud at various points throughout the broadcast — not in a partisan manner for Clinton, but for the sake of the town hall’s television optics. Approximately 15 minutes before the show, the producer ran the audience through a practice round of applause and noise-making. The results of the audience-prodding turn up in the show’s video. Ovations were plentiful and, quite often, spontaneous. Clinton’s statements on gun control, immigration and other hot topics earned her crowd approval on her own merit. The audience at home was supposed to absorb the message that Hillary was very comfortable among the people, popular with the people, and really succeeding with the people. Except “the people” were partisan astroturf, carefully carpeted for appearances. The crucial words here are “standard practice.” The networks “book” an audience of liberals, who are show “diversity” in that some want liberal answers on gun control, and some want liberal answers on marijuana, and some want liberal answers on amnesty. Several questioners identified themselves with Johns Hopkins, which might make a viewer assume that Johns Hopkins was the event’s host. Don’t buy that. Hillary is averse to spontaneity and surprise. If there was a chance for Tea Party conservatives to walk right in and ask questions, would she have said “Sure, bring it on?” Not a chance. This audience was negotiated before they were coached to applaud.